We are living in the last days...pray we may have the grace of final perseverance. May God send His angels to protect and lead the remnant church. "Saint Alphonsus Ligouri: "The devil has always managed to get rid of the Mass by means of the heretics making them the precursors of the Antichrist who, above all else, will manage to abolish, and in fact will succeed in abolishing as a punishment for the sins of men, the Holy Sacrifice of the Altar, precisely as Daniel predicted." This is the crux of the matter. Those Catholics who aren't concerned about Francis need to WAKE UP! Stay close to the Blessed Mother!!! Consecrate yourselves to her and if you already have.....DO IT AGAIN!!!! Pray the Rosary DAILY!! Get thee to CONFESSION and go to receive Christ in the Eucharist often!! The catacombs are coming quickly!! We will have to find faithful priests to say a true Mass in our homes or whatever place we can, we CANNOT participate in this Satanic abomination!!!! The Blessed Mother has promised that those who stay close to her she will keep under her Mantle of protection and lead all to her Son. Our Lady of Fatima PRAY FOR US!! The days of the Apocalypse have arrived! Masonic Forces are striving to impose a false church, a whore, on the faithful. Pray, fight Church Militant! The Devil hates the Mass, hates the Eucharist. And he is now operating within the Vatican. 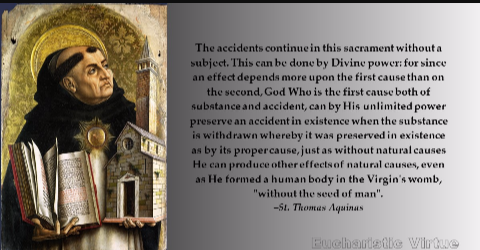 Transubstantiation IS A DOCTRINE taught by the Church, in Holy Scripture, in various Councils, esp Trent, to deny it is to call upon yourself Anathema sit. END OF DISCUSSION. We already have an "Ecumenical Mass" in the existing Novus Ordo Missae! "We must strip from our Catholic prayers and from the Catholic liturgy everything which can be the shadow of a stumbling block for our separated brethren—that is, for the Protestants." "The intention of Paul VI with regard to what is commonly called the [Novus Ordo] Mass, was to reform the Catholic liturgy in such a way that it should almost coincide with the Protestant liturgy — but what is curious is that Paul VI did that to get as close as possible to the Protestant Lord’s Supper … there was with Paul VI an ecumenical intention to remove, or least to correct, or at least to relax, what was too Catholic, in the traditional sense, in the Mass and, I repeat, to get the Catholic Mass closer to the Calvinist Mass." Also, Michael Davies, the Welsh critic of the post-Vatican II liturgy, cites in his book Pope Paul’s New Mass many Protestant theologians and pastors praising the Novus Ordo Mass for its “ecumenical” dimensions and having no qualms in using it (although only with the Second Eucharistic Prayer).